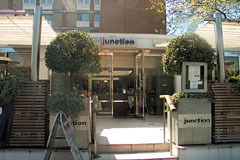 The Junction restaurant is set within the Holiday Inn, with its own entrance on Haverstock Hill. Food is served all day from the a la carte menu, the two course lunch menu at £7.95 and evening set menu at £13.95 for two courses or £16.95 for three courses are excellent value. This is a modern, light and airy venue with a superb heated patio for al fresco dining. The Junction prides itself on standards of service and a warm and friendly welcome. Open every day 7am-10.30pm. All major credit cards accepted (not Solo/Delta/Electro). No service charge.